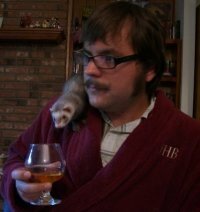 As well as being possessed of an impressive moustache and a shoulder ferret, Jesse Bullington is also in possession of a prodigious writing talent. His debut novel from Orbit, The Sad Tale of the Brothers Grossbart, sent two nutters off on crusade and met with the proverbial rave reviews. His new book, The Enterprise of Death, looks sure to follow suit. His short fiction has appeared in anthologies such as The Best of All Flesh and Running with the Pack. Below, he pits the cheap donut against the cheap danish – wisely. Change “pair” to “multitude” and you’ve got a worthy question for quite a few popes and kings, don’t you? In terms of my debut novel, it was a case of taking the adventures stories I grew up on (Burroughs, Kipling, Robert E. Howard, etc.) and injecting a horse syringe of reality into the stock set-up of badass-Anglos-go-east-and-sort-out-the-savages. The titular twins of The Sad Tale of the Brothers Grossbart are fueled by greed and warped religious sensibilities, as well as booze, bloodlust, ignorance, and a desire to escape trouble at home, which I think fills out the Crusader motivation bingo card pretty thoroughly. 2. You get to go back in history for one day: where do you go, what do you do, who do you hang out with? I’d visit myself at the onset of high school and give myself a very long talking to, creating one hell of a disruption of the space-time continuum in the process. After that I’d hop on a plane and see whichever of my favorite bands who’s since lost members that’s playing that day–obviously before hopping back in time I’d need to consult some tour schedules to pick the best day to drive teenage-me insane and take in some music. Assuming that’s off the table, it becomes tough to narrow down a single historical event that I’d most like to witness. There’s definitely the temptation to materialize on the prow of a certain boat in October of 1492 and give a certain Genoan a bump over the side of the ship. After that I’d spend the rest of the day swimming (the Bahamas are lovely that time of year, as I understand it) and convincing the crew that turning around was the soundest plan, lest they arouse my wrath–chrono-equivalent of the Prime Directive be damned, I’d convince those suckers I was God and get all kinds of footbaths as we started home to Spain. … to listen to people who tell you that you’re doing something wrong/clumsily/stupidly/poorly/etc. It’s tough, because some people will give you terrible advice and others will give you invaluable suggestions, but both will be telling you that something you’ve done could be done better–learning to take criticism on the chin is important, but learning to recognize when it’s valid versus when it’s simply a difference of taste (or sheer folly) is crucial. This is something I’m still sorting out for myself, because often it will be the same person simultaneously giving you both objectively useful advice and advice that amounts to personal preference, but before you can even begin to separate the wheat from the chaff you have to be able to properly listen to and absorb criticism in general, which can be harder than it sounds. … I’ve had a really bad time of it and want to whinge about my workday only to realize I don’t have any right to complain whatsoever because I’m doing what I love most in the world, what thousands of people would kill to be able to do. Nothing’s so frustrating as not being able to whine with a clear conscience. Depends entirely on the roast of the bean, the quality of the baker, and the humidity in the room. As a general rule, I’m more inclined to trust the cheap donut over the cheap danish, which I think is just plain horse sense. This entry was posted in Drive-by Interviews, News, On Publishing, On Writing: General and tagged drive-by interview, jeff vandermeer, Jesse Bullington, orbit, Running with the Pack, The Best of All Flesh, The Enterprise of Death, The Sad Tale of the Brothers Grossbart. Bookmark the permalink.